The Council of Chieftains has officially adopted the R. D. Dunkin Leadership in Service Award. 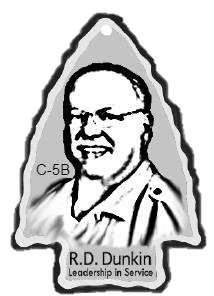 The first Section C-5B presentation is set for the 2019 Tornado Alley Rally Conclave and will be awarded at every Section Conclave to follow. This award is designed to recognize those within Section C-5B who go far beyond their immediate responsibilities as Arrpwman and by doing so have laid a path of excellence for other Arrowman to follow. The award is named after R. D. Dunkin, who believed that young people can grow to exceptional strengths and reach their full potential with the right combination of leadership, education, mentorship, and love. R. D. Dunkin served as the Central Region Order of the Arrow Chairman for sixteen years and is responsible for shaping the region structure and program into what it is today. Dunkin completed his Ordeal in Mitigwa Lodge in 1961. The Eagle Scout was from Ames, Iowa. Great friend and mentor.